Add your own racing stories & visits, discuss series from now or long ago or tell the stories of your idols. As long as it involves motorsport chat this is D place. As the last three rallies are coming up, we are in an exciting situation where Toyota's Ott Tänak has turned the title race into a three-way battle after taking consecutive victories in Finland, Germany and Turkey. Thierry Neuville is still in the lead while Ogier is in a downward trend, having taken his latest podium in Italy and his last victory in France way back in April. Behind them, Esapekka Lappi's consistent performances and Jari-Matti Latvala's recently improved form have helped propel Toyota into the top spot in the constructors' race, just ahead of Hyundai. In terms of the 2019 season, Ford's failure to increase support to M-Sport has led to Sebastien Ogier transferring to Citroën, taking his Red Bull sponsorship with him. It looks likely that he will be joined by Esapekka Lappi who has supposedly rejected Toyota's offer. According to rallyssimo.it, he will be replaced by the Citroën reject Kris Meeke, although Jari Huttunen has also been rumoured to join the team. Jari-Matti Latvala's continuation is considered likely. In the meanwhile, M-Sport has signed Teemu Suninen for a full 2019 campaign. 2019 Factory teams have unveiled their schemes. I don't know who designs the M-Sport liveries but they certainly do a bang-up job with it. It is such a beautiful blend of different shades of blue with an elegant half-tone pattern applied to it. The white accent color is used very subtly in a way that enhances the livery despite being barely noticeable. 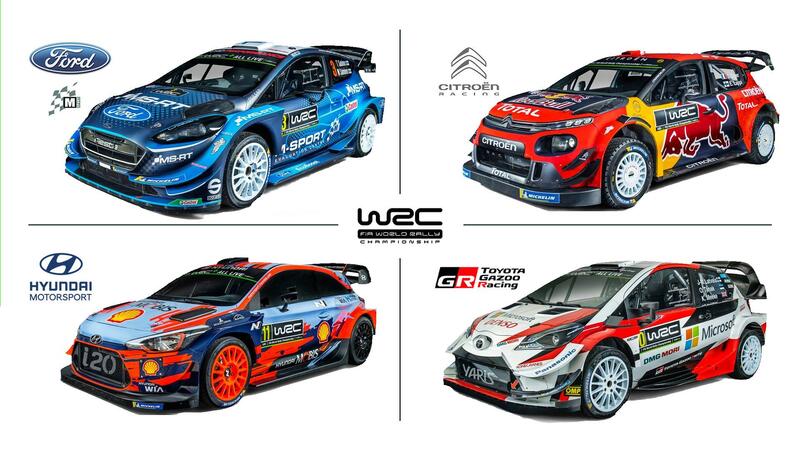 That might very well be the best new livery of 2019 - and not only in WRC. Citroën combines their traditional red with the blue and yellow of Red Bull in a very conventional way. The way the blue and red are divided almost vertically on the side looks clumsy and almost like an afterthought - and whose underpants is that pattern from? Still, the colors work well together and even though this would not win our livery competition, the car will still look very good in TV images. Then we have Hyundai with its blueberry milk background blue. They finally noticed their livery was getting stale so they decided to jazz it up by doing the same livery as always but this time with abstract patterns. Like Hyundai's target audience - soccer moms who wear shredded jeans - the new Hyundai livery fails to convince anyone that it's trendy and exciting. The Toyota livery is still a national level livery with some mighty big sponsors. Microsoft is certainly in the right spot as I predict we will see a lot of crashes. I'm all for Tänak again, although I also hope Suninen can have his big breakthrough. Wouldn't mind seeing Lappi doing well but his chances are smaller than those of a snowball in a hot place. If Meeke does well at Toyota, it proves my theory that Citroën only works for French drivers.